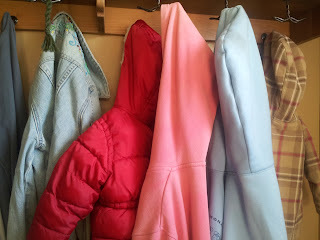 Sort all the jackets by color...How many are blue, white, orange, etc.? Make a graph. You could do less specific coloring--light vs. dark. Sort the jackets by plain vs. ones with emblems or hoods vs. no hoods. What percentages are they? Make a pattern with them and have your classmates see if they can recognize the pattern. Wade a jacket up to a ball and see who can toss it the farthest--measure the distance. See how many jackets you can put on until you can't move your arms--then have people guess how many jackets you are wearing. Find out the total cost of the jackets using the purchase price. What other activities can you come up with using JACKETS?